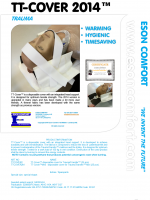 Eson Comfort invents and manufactures medtech concepts. We present solutions and design tools on the basis of a problem description. 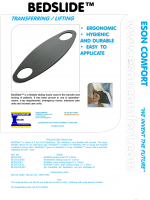 All of our products in our extensive brand catalog, has been developed this way. Give us your problems and we will give you the solutions! 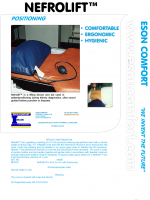 The history of the company’s medtech innovations and current focus starts in 1999. 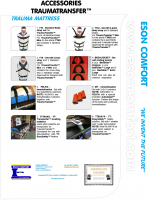 Eson Comfort formulates a number of solutions to ergonomic problems at Halmstad Hospital. 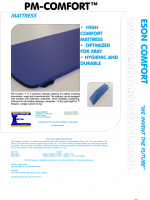 Jörgen and Anders Erlandsson produces a new innovation, the PM Comfort™ – High comfort radiology mattress with handles and lowfriction underside. Erik Erlandsson develops Anders innovation, Nefrolift™ – Lift Concept for kidney investigations. Legfix™ – Fixation of legs is designed the same way. 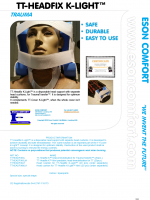 TraumaTransfer ™ – The leading and only comprehensive solution for optimal treatment of trauma patients in emergency rooms. 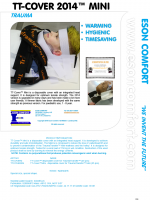 This innovation gives the family company Eson Comfort and Anders Erlandsson, Halland County Council Inventors Award in September 1999. 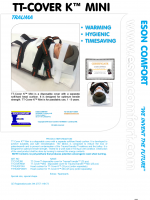 In the following years there will be a stream of new Eson innovations. 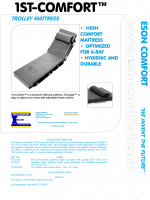 Eson Comfort launches the new positioning concept, SPACE™ – Positioning cushions with brand new revolutionary characteristics. This innovation by Anders is like so many other of the company’s innovations, examples on how we use the staff’s dissatisfaction with existing solutions to provide the basis for new and better solutions. In 2000 it is time for the next groundbreaking innovation, BedSlide ™. The first elliptical sliding board. 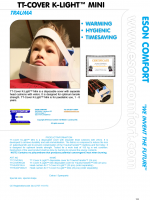 Anders develops it as a device for transfers to our trauma mattress. Nowadays it is a general solution that is used in many different health care settings. 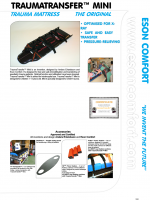 A few years later, we develop the emergency trolley mattress – 1st-Comfort™. This solution includes a number of innovative new solutions by Anders, made together with Erik. 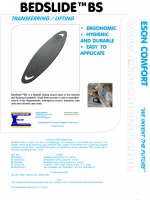 Flat, smooth top, new materials, increased pressure relieve, adjustable head pillow and our own EsonGrip™-system with a firm grip. 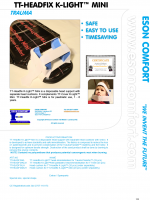 In 2005, it was time for TT-Cover™, disposable cover for TraumaTransfer™. 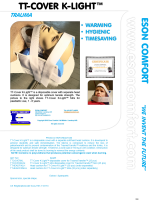 This newly developed and proprietary immobilization innovation by Anders, provides staff in emergency rooms completely new possibilities for the safe handling of patients. 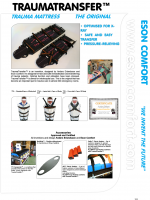 Immobilization and rescue sheets in a single solution. 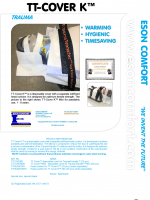 This is further proof of the innovation factory in Landeryd and it results in Eson Comfort received the award “Company of the Year 2005“. We have since 2012, our own sales organization, as our former partners who took care of all our sales, decided to break the longstanding and conditional deal we had. We continue despite it, just as stubbornly to question those who claim that things are impossible to solve, and will in the same way as we have done since the start, constantly prove them wrong. In spring 2013, Eson Comfort were chosen to represent Halland, when we as one of a few companies, got the privilege to be visited by the King and Queen during their Sweden tour. We told our story about how our small businesses, through our innovations have changed and improved health care in most of the hospitals in Scandinavia and parts of Europe. Later in the evening, Anders with his wife Kerstin were invited to dinner at Halmstad Castle. Anders and Swedens Queen Silvia was placed at the head table and had a pleasant talk during the dinner, everything from innovation to family life. It was with great pride our small family business received so much praise in the King’s acceptance speech at Halmstad Castle and I was delighted that we had a larger part of the speech than one of Swedens greatest companies. Our importance to the upgrade of health care is perhaps greater than we have understood. In December the same year, Anders and Kerstin got a personal invitation of His Majesty the King to dinner at the Royal Palace. 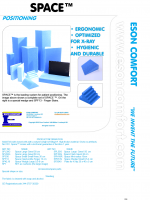 Eson Comfort got the honor of being the only company representing the entire county of Halland. Kerstin and Anders at Royal dinner!